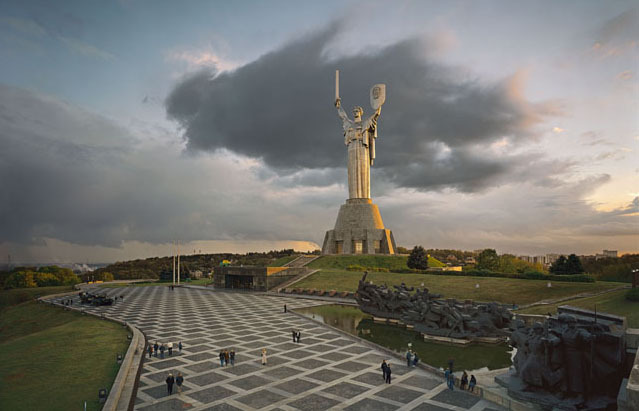 Photo of Motherland, Kiev by Andrew Moore, courtesy of the Koffler Centre of the Arts. ART: New York–based photographer Andrew Moore examines modern Russia in all its beauty and contradictions in Russia: Beyond Utopia. The exhibition captures images of the country as it grapples with the vestiges of its Imperial past, and as it moulds remnants of the Socialist dream into an emerging, complex capitalist democracy. The Koffler Chamber Orchestra complements the exhibition tonight with From Russia with Love. The performance highlights works from some of the country’s most famous composers, including Arensky, Shostakovich, and Tchaikovsky. Exhibition: Loggia Gallery, Koffler Centre of the Arts (4588 Bathurst Street), 9 a.m.–6 p.m., FREE. Concert: Toronto Centre for the Arts (5040 Yonge Street), 7 p.m., $20 or $10 for students. GARDENING: The Guerilla Gardeners strike back. Planting flowers and plants around the city, with or without permission, the guerillas “vandalize” Toronto’s public spaces at will. Members of the GG community range from high schoolers to mid-career professionals, and they want you to join them this morning as they paint the east end green. Bring family and friends, along with whatever plants, yard-waste bags, garbage bags, and gardening tools you have available. Eastern Avenue and Caroline Avenue, 11 a.m., FREE. FAMILY: The first Pedestrian Sunday of the year takes place today at Kensington Market. P.S. Kensington offers a short reprieve for pedestrians by reclaiming the streets from messy traffic and parking on the last Sunday of every month, from now until October. Regular events include street performances and a market of locally grown produce. This summer, there will also be a cinema set up in the back alleys of the market, showcasing independent films from around the world. Today’s grand opening offers a giant piñata for the kids and a poetry slam at Uprising Books. Kensington Market, 1–7 p.m., FREE. PARTY: The Oakwood-Vaughan neighbourhood is celebrating the release of Visionists, a community hip-hop CD, with a free block party at Montage Support Services (which we wrote about on Friday). The CD is the collective work of seven young and emerging rappers between the ages of ten to thirty-one, and the album deals with the myriad of social-political, economic, and identity issues facing Toronto youth. Break-dancing performances, music, and free food will liven up the party. Montage Support Services (504 Oakwood Avenue), 2–4 p.m., FREE ($5 for CD, proceeds go to Art Starts). CHARITY: The Toronto Zoo gives you an opportunity to have fun, get exercise, please the kids, and raise money for a good cause, all at the same time. At today’s fifth annual Great Strides walk for cystic fibrosis, participants who collect a minimum of $25 in pledges will receive free admission to the Toronto Zoo, a walk route map, free lunch, a children’s loot bag (subject to availability), as well as admission to a family theatre show in the morning. Toronto Zoo (361A Old Finch Avenue), registration 8:30 a.m.–12 p.m., walk activities 9 a.m.–2 p.m., PLEDGES accepted.